* "FACDM 1005/6" on labels. 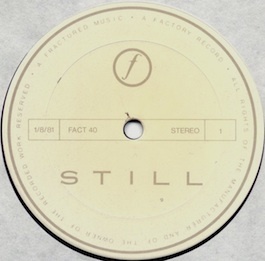 ** Back sleeve states "Manufactured and Distributed by EMI Australia Ltd.", but was cut by CBS Australia as indicated by the MX number and the 2.5” ring size on the label; “FACT 40” on labels. *** Cassettes come as two single cassettes (originally fixed to eachother by black adhesive tape that reads in white “Great Value Equivalent to 2LP’s”). Edition of 500 each. Notes: Date on label: 1/8/81. Apparently the prefix FACDM stands for Factory Double Multiple. CBS had a code system for their pricing and the M relates to it. The four sides of the CBS album edition were cut by four different people. Also promo poster, 30"x40", designed by ANDREW PENHALLOW. As for all 'Still' LP and CS releases worldwide (excluding the black label Italian edition) the sleeve track listings mistakenly omit "Twenty Four Hours".